So apparently Sbarro is looking into bankruptcy, though the company may not file. The pizza chain moved into malls in 1967 and has 1000 stores worldwide. I am no giant fan of mall-style pizza (give me Chicago deep-dish any day), but I remember when I worked in downtown Mpls and would sometimes get a pasta dish at Sbarro. They are one of those chains that is in every other food court, and yet my eyes kind of blip over them when making a food-court choice, because they always seem so heavy and greasy. Looking around the Web, I admit, this person's photo and longing almost made me rethink my Sbarro disinterest. My favorite food court was the old food court at Maplewood Mall in Minnesota. It was down on the lowest level and was a circle. Friends and I would start at Baskin-Robbins and just start walking, and eventually each of us would drop off at whichever place we wanted our lunch from. Then we'd walk on, and eventually meet back up by the Baskin-Robbins again (Daiquiri Ice, mmm!) I can't remember what all chains were in the food court though. But I can recite the Mpls City Center food court almost by heart since I used to work in a bldg one skyway away from it. McDonald's, Great Steak & Fry, Eddington's Soup and Salad (these really need to move out of Minnesota, dammit), Taco Bell, Cinnabon, an Arby's with its own reserved seating, etc. Healthy, I know. Are you a Sbarro fan? 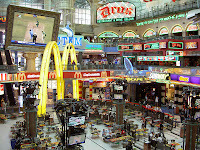 What's your favorite food-court chain? Got any regionals, like Eddington's, that you recommend? And all this food-court talk reminds me that "King of the Food Court," by King Radio, is about the best song ever. But I can't find it on You Tube. Take my word for it. And you can listen to a sample on Amazon. "Plastic trays and paper plates, all the people here got dates, with the King of the Food Court." Orange Julius was always my favorite, I loved their double cheeseburger and steak fries with of course an Orange Julius. I also (and I kind of hate to admit this) I used to also love the cafeteria restaurant in our mall! When I was a kid in the mid- to late '70s, my mom would take me and my friends to lunch at the cafeteria in our mall's Woolworth's (that *was* the mall's food court back then). We all thought that was really special. 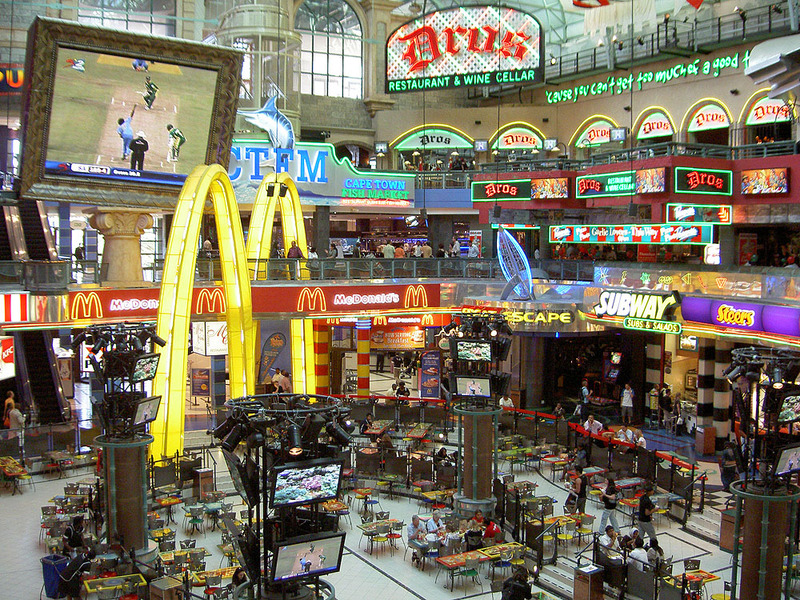 Most of the food court restaurants I remember weren't chains, but mom-and-pop pizza, burger or Chinese joints. Bain's Deli was one chain that stood out, as it was -- along with Sbarro -- the one place you could get food that was reasonably healthy. And when Cinnabon appeared, it was a minor sensation. The big fast food chains put a lot of these small operators out of business when they got into the mall game (the first time I encountered Subway, Saladworks and Chik-Fil-A was in mall food courts). Nowadays, in the upscale malls at least, the trend seems to be moving away from fast food and toward sit-down establishments like Ruby Tuesdays, Bahama Breeze and Cheesecake Factory.